Notch, Suda51, Peter Molyneux, Kim Swift and a dozen other indie devs have chosen their favorite games from more than 300 submissions to Indie Speed Run 2.0 - but there can be only one. Three months after it began, the Indie Speed Run 2.0 has come to a close. More than 300 games created in a 48-hour window by developers from around the world were submitted to this year's competition, and from that great, seething mass of indie entertainment, favorites were chosen by a panel of industry luminaries including Notch, Molyneux, Swift, Brian Fargo, Ron Gilbert, Trent Oster and many others. But only one man has enough hat to declare the final winner: the man of Zero Punctuation himself, Mr. Yahtzee Croshaw. The winner of the Indie Speed Run 2.0 Grand Prize is... well, I'm not going to spoil it for you. Listen below to find out (and to hear about a few honorable mentions too) and then take them all for a spin to see if you agree with his judgment. Or just some of them, if you prefer. It's really your call. Woo! And have no fear, for the Indie Speed Run will return next year. 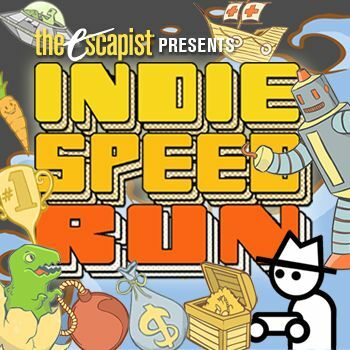 For more information about the event, how to compete, or how to get in on the judging process, you can head to indiespeedrun.com.